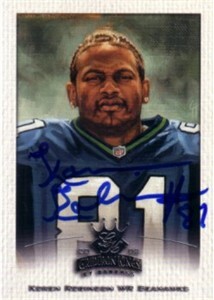 2002 Donruss Gridiron Kings promo or sample card autographed on the front in blue marker by former Seattle Seahawks star receiver Koren Robinson. With certificate of authenticity from AutographsForSale.com. ONLY ONE AVAILABLE FOR SALE.